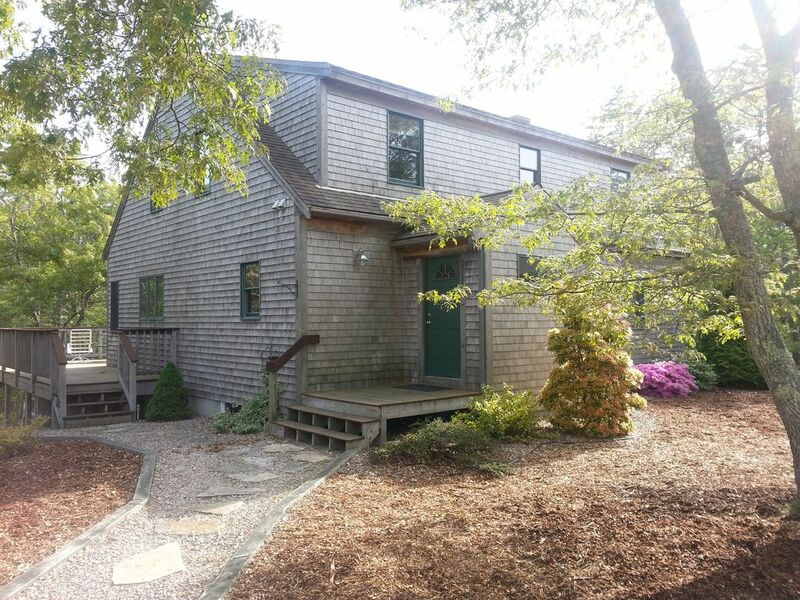 Newer constructed home located on the Ocean side of Wellfleet, a 1/2 mile from Gull Pond and 1 mile from Newcomb Hollow Beach. Our house has hardwood floors and lots of sunny windows overlooking a secluded hollow in the woods. There is a large south facing deck with bar-b-cue grill and a private outdoor shower for your enjoyment. The kitchen is user friendly with a center island opening up to the great room. The open floor plan with skylights makes for a great gathering place for the whole family. Fast, strong wifi for your internet needs. You will always find an exceptionally clean house upon your arrival. This is a spacious, well-maintained, bright house nestled in the trees. The floor plan is great for vacations with an open kitchen/dining/living area and a 1st floor mater bed and bath and lots of windows. The second floor bedrooms are also spacious and bright. The kitchen is well-stocked and has an efficient layout. The rear deck is very accessible and a great place to relax. The owner lives next door and is very responsive to any problems with the house, provides great service and is very knowledgeable about the area. The location is very convenient to the Wellfleet ponds, ocean and Wellfleet Center, but is quiet and away from the crowds. We have rented this house for 4 years and plan to continue for many years to come. We highly recommend this house. Thank you for the review Pam. Just wanted to point out that we had two flash floods this summer which effected our driveway. In fifteen years of renting we have never had an issue with any car on our driveway. This house has everything we've looked for in a Cape Cod vacation. We have always loved Gull Pond on previous trips to Wellfleet and were delighted to stay in this beautiful house last month. The property is private and quiet and the house was comfortable and immaculate. The house is close to all our favorite restaurants and take out places. Our family enjoyed paddleboarding on Gull Pond through Funseekers, and the proximity to the ocean beaches. There is plenty of space in the house to spread out and a lovely deck to enjoy. We can't wait to come back next year. Thanks, Eric. We stayed in this wonderful house in Wellfleet a few weeks ago, and had a very relaxing time. It is very spacious, bright, and clean, and it fit our 2 families perfectly. There is a well-equipped kitchen, and a great porch for grilling and eating meals. The house is very secluded and quiet; it's on a dirt road in the woods. All of the gorgeous beaches of Wellfleet are nearby, including the ponds. You can get a beach pass for the week, which gets you into practically all of the Wellfleet beaches. I would definitely recommend getting baked goods at PB Boulangerie, drinks at the Beachcomber, and eating as many oysters as you can! This is a light, airy and very clean house with a great layout. While the owner lives nearby, the house felt very private and away from the busy summer traffic. At the same time it was close to town, ponds and ocean beaches. There are 3 bedrooms upstairs and the master on the first floor which worked well for our family. The house has a well equipped kitchen on the open layout first floor. We loved the large dinning table which worked well for both lobster dinners and large jigsaw puzzles. We suggest ordering to-go from Moby's if you don't want to cook the lobster yourself. After 30 years of renting all sorts of houses in Wellfleet, this was our second year staying at this house and we hope to return next year. Our family has a variety of interests and requirements but this house satisfied everyone. There are many activities to partake in without having to travel very far. Hiking and mountain biking trails are just outside your front door. A paved bike trail is also very close by taking you to the next towns over and ocean beaches. Kettle Ponds are 0.5 to 1 mile away and walkable for the sturdy. Gull Pond offers swimming, fishing, kayaking, canoeing and sailing, and is the closest being 0.5 miles from the house. Enjoy several of Wellfleet's ocean beaches for beach-combing, fishing, surfing and playing in the waves, these are just 1 to 2 miles from the house. Wellfleet is well-known for its many artists and thus has several art galleries as well as a theatrical playhouse. Wellfleet also has a golf course, tennis courts and a skate park. On Wellfleet's bayside Great Island offers 8 miles of hiking through a tidal ecosystem, as well as bayside beaches which can offer great views of the summer sunsets.